Hummingbirds are particularly fond of bright red flowers. Bee Balm and Cardinal Flower are two of the hummingbirds' favorite nectar sources. One of the most rewarding experiences of gardening and landscaping is viewing the wildlife that your garden attracts. Butterflies, hummingbirds, bees, insects, rabbits, squirrels and other wildlife find refuge in backyard gardens. Some seek shade, others hunt for food, and some species make our gardens their homes. While rabbits and squirrels may not be the gardener's favorite wildlife, the vibrant colors of fluttering butterflies and the graceful dance of hummingbirds feeding on nectar producing flowers add greatly to the beauty of a garden in bloom. Many of the same colorful, fragrant, nectar-producing blooms attract butterflies as well as hummingbirds. It's important to create a host environment for larvae and caterpillars as well, which later transform into those butterflies. 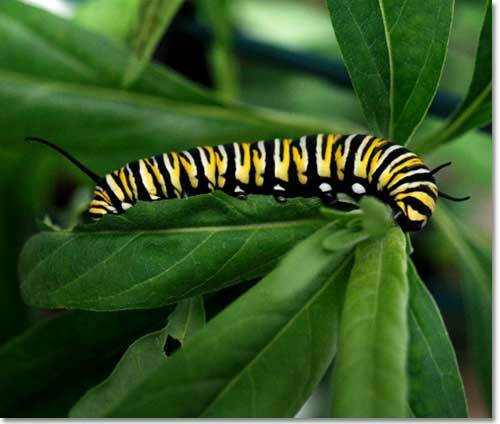 Good host plants are leafy and can provide shelter and food for larvae and caterpillars. A butterfly on a butterfly bush bloom. Butterfly bush (Buddleia davidii) is a perennial that attracts butterflies, hummingbirds and bees with its large, fragrant panicles. The butterfly bush should be included in any butterfly or hummingbird garden. Butterflies are attracted to colorful, fragrant flowers that are shallow and easy to perch on. Food in the form of nectar, or sometimes rotting fruit, sap, or even animal waste will lure butterflies to plants. Nectar is the primary attractor; it feeds both butterflies and hummingbirds. Color and fragrance are also important features that draw butterflies and hummingbirds to your garden. Hummingbirds are particularly fond of bright red, purple, white, pink, orange and blue. Bee balm and cardinal flower are two of the hummingbirds' favorite nectar sources. These plants, however, don't have a long bloom life, so it's important to add a variety of other nectar-bearing flowers to ensure a longer feeding season. As you design your garden, take into consideration where you will be when viewing the wildlife that comes there. Vines and crawling plants that grow on trellises or in hanging baskets can be placed near windows and seating areas for indoor viewing. Butterflies are cold blooded and enjoy sunning themselves. Select a garden area with full sun or at least six hours of full sun. Include some flat rocks or other light colored flat surfaces for basking. Butterflies and hummingbirds also like to be sheltered from the wind, so be sure to give them a protected area. A bird bath, pond, re-circulating fountain or other water element adds dimension and activity to any garden. Birds love water in wide, shallow pools that are elevated off the ground approximately three feet or higher. Keep the depth at the center of the bath to a maximum of three inches – shallower at the edges when possible. A simple and inexpensive idea is to use a plastic or metal garbage can lid. You can elevate the lid on a small table or ledge, or prop it up on a tree stump. You can place a few large rocks in the center to hold the lid in place and to serve as a perch for the birds while bathing. Another solution is to use a couple of shallow pans filled with sand and water to create a shallow puddle that can used as a water source. Be sure to clean any water source frequently though to avoid mosquitoes! Place your birdbath in view of a window so you can enjoy the birds' activities from inside your home. Place the bath near a hose so it is easy to fill up. If you create moving water with a fountain, drip or other type of spray mechanism your birdbath will attract more birds. as part of your butterfly garden. Below is a list of some of the more common plants that attract butterflies and hummingbirds. Many plants attract both, but each of these species has their favorites. Place groups of plants together; don't plant single plants standing alone. This pattern is more effective in drawing butterflies and hummingbirds into your garden. Iinclude native grasses and shrubs to act as a food source for larvae and caterpillars. A list of food source plants is also included below for your reference. Once your garden is in bloom you will begin to enjoy the colorful life that the fragrance and nectar-producing plants attract. Don't forget to build in a couple of comfortable and convenient wildlife-viewing seating areas where you can relax and enjoy the butterflies, hummingbirds and other wildlife that venture into your garden! Bee Balm (Monarda didyma) - long-blooming perennial that has red or purple blooms. Good for zones 4-7. Bee Bush (Aloysia gratissima) - can grow to 8 feet high and has white flowers. Attracts butterflies. Butterfly Bush (Buddleia davidii) - a perennial that attracts butterflies, hummingbirds and bees with its large, fragrant panicles. The butterfly bush should be included in any butterfly or hummingbird garden. 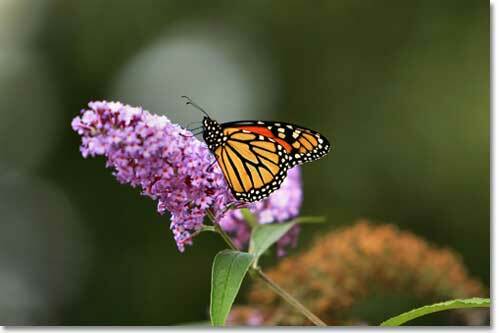 Butterfly bushes can grow 5 to 12 feet tall with a spread of 4 to 15 feet. The color of the flowers can vary, but the most common are purple, pink, white, or red. Butterfly bushes flower from June/July through fall. Bushes should be cut back in the winter to allow new growth in the spring months. Butterfly bush plants grow well in full sun and well-drained soil. They are also drought-tolerant. Cardinal Vine (Ipomoea x multifida) - has a red bloom and does well north of zone 6. Fern Acacia (Acacia angustissima) - attracts butterflies and is a larval plant food. The blooms are white and it is a low-growing shrub with plant heights reaching 1 to 3 feet high. This plant grows well in full sun or partial shade. The hardiness zone for this plant is zone 8. Fuchsia does well in shaded areas. 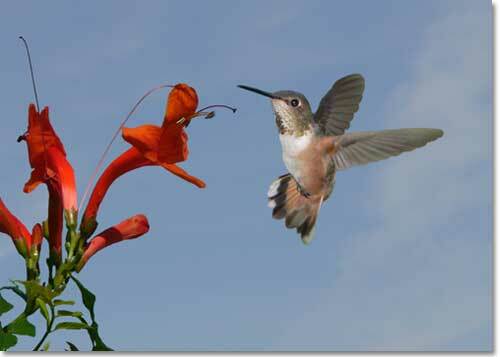 These flowering plants are popular with hummingbirds. They produce blossoms in orange and pink. The hardiness zones are 9-11 for this plant. Lantana (Lantana camara), Trailing Lantana (Lantana montevidensis) - attracts all types of butterflies and hummingbirds. Lantana comes in a variety of colors including red, orange, yellow, purple or blue and white florets. Lantanas grow well in zone 8 and higher. Larkspurs (Delphinium) and Hollyhock (Alcea) - Perennial plants that can grow to 5 feet tall or more. Delphiniums are good for zones 2 - 9 and are available in a variety of flower colors. Hollyhock grows in zone 3 and has white, pink or red flowers. Rabbitbrush (Chrysothamnus nauseosus) can reach heights of 4 feet, with yellow blooms from September through November. Attracts many butterflies and is one of the best choices for fall nectar flowers. Red Bird of Paradise (Caesalpinia pulcherrima) will reach heights up to 7 feet with red/orange blooms May through October in full sun. This plant attracts swallowtails, sulfurs and some skippers. Rose of Sharon (Hibiscus syriacus) - With heights of 8 to 10 feet this shrub shows red, pink, blue or white blooms. Zones 5 - 9 are recommended. Sweet Bush (Bebbia juncea) drought-tolerant, attracts all types and sizes of butterflies. It has yellow blooms spring through fall. Trumpet Vine (Campsis radicans) - Trumpet vine produces orange colored flowers and is hardy in zones 4-9. It is a climber vine, so if you build a trellis or fence it will climb and create a nice station for hummingbirds and butterflies to perch. Trumpet or Magnifica Honeysuckle (Lonicera sempervirens 'Magnifica') has scarlet/red flowers and does well in zones 3 - 9. This vine is a creeper not a climber. Verbena (Verbena gooddingii) is a native and attracts all types of butterflies. They grow very well in dry, desert climates in zones 5 to 10. They are tolerant of drought. Silk tree, or Mimosa (Albizia julibrissin) is a tree that attracts hummingbirds and butterflies. It has full pink blossoms that are very aromatic. This tree grows well in zones 6 - 9. Popular caterpillar food plants are the passion vine and senna (Senna covesii, Senna leptocarpa or S. lindheimeriana). Pipevine (Aristolochia microphylla) and milkweed varieties including common milkweed (A. syriaca), pine-leaf (Asclepias linaria), narrowleaf (A. subulata), and butterfly weed (A. tuberosa). Fern acacia, Acacia angustissima (A. hirta) and native mallows like Abutilon, Herrisantia, and Sphaeralcea also make good food plants. Desert hackberry (Celtis pallida) is another larval food plant that also attracts Empress Leilias with sap and rotting fruit. A few others to consider are side oats grama (Bouteloua curtipendula), bamboo muhly (Muhlenbergia dumosa) and green spangletop (Leptochloa dubia). Plant Hardiness Zones are a great way to decide what to plant in your garden. All plants come with a suggested zone range for optimal grown and survival. The hardiness zones divide the United States up into 11 zones based on a 10 degree Fahrenheit difference in the average annual minimum temperature.